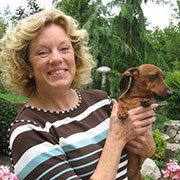 "Diane demonstrates a great depth of knowledge in pet health and medical care, as well as pet behavior. 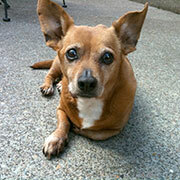 As Abby has aged, Diane has accommodated Abby’s changing medical needs and notices any changes in her medical status. 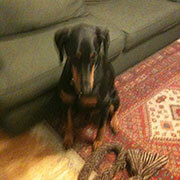 Abby is relaxed and happy upon arrival and pick-up in Diane’s home. 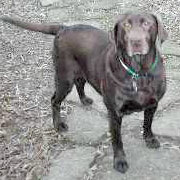 Diane makes her feel comfortable, loved, and cared for in her clean, pet accommodating home." "I like coming to Diane’s. She really cares for me." 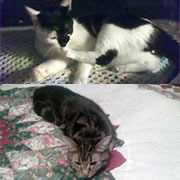 "I highly recommend Diane to anybody looking for any kind of pet sitting or pet assisting service, and/or house sitting. When we go away, she literally is my peace of mind, and words cannot describe how grateful I am to have Diane in our lives." "We like Diane. She plays with us." "Diane is 100% reliable, which is important when your household includes aging pugs, foster dogs for the golden retriever rescue, lizards, cats, and rodents! We like to know that a knowledgeable and sensible person is in charge of things when we are away. Diane stands apart because of her good judgment and she has never failed to respond properly in the event of thunderstorms, package deliveries, dirty cages, unlocked doors from workmen, or unexpected animal medical conditions." "Diane plays with us when our owners are away. She throws the ball and and takes us for walks." Diane has been caring for my three dogs for the last 2 ½ years and I could not be more satisfied with her services. She has provided both daycare and boarding for my pets and I know that when I leave them with her, I do not need to worry as they are in capable hands. She is a kind and attentive caregiver for all of her four legged clients and my dogs are always excited to go spend time with her. She provides love, attention and exercise and my babies are always happily exhausted and well socialized when I pick them up. Additionally, she is extremely knowledgeable and attentive to those with pets with ”special needs” related to health issues. "We get bored at home when we can’t go to Diane’s." I have a much better time on vacation knowing that my dog Doc is not only well taken care of but happy. It is wonderful not having to worry about him while I’m gone. I was impressed by the fact that Diane provides a home setting. Doc is an indoor dog and used to being inside all day. You can tell right away that the dogs are happy and safe. The true test was the second time I dropped Doc off for another vacation...as soon as I let him out of the car he ran to Diane’s door knowing that he was going to get to spend time with her. That pretty much says it all. I always feel confident and at peace dropping Doc off while I am vacationing. "Going to Diane’s is fun. She holds me on her lap." 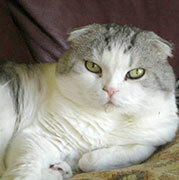 Diane was tremendously helpful in providing care to my beautiful Scottish Fold cat, Missy. Missy was severely asthmatic and required medication in the morning and evening. Diane skillfully administered oral and injected medication as well as two inhalers. 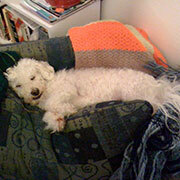 Without her dependable services, it would have been almost impossible for me to leave town for even a few days. Whenever I returned after Diane had been caring for Missy, it was clear that my cat had been well cared for. I must have a great deal of confidence and trust in someone in order to give them access to my home and my pet. Diane was worthy of that trust, and it was always comforting to know that she was visiting my home twice a day, not only caring for Missy, but making it apparent that there was a presence there while I was gone. "Diane treats me with respect and gentleness when she gives me my medicines and shots. It doesn’t even hurt!" I would like to introduce to you to our Chocolate Lab, Princess Carmella Wiles, which is her registered name; we call her “Charlie”. She is part of our family since birth, now 9 years old, and the love she has for all of us is incredible! With our busy schedules, we hired Diane Mead to come and care for Charlie, walking & exercising, brushing, playing and letting Charlie know that there was yet another person that loved her also. It became obvious that Diane fell in love with her too! Charlie looked forward in Diane coming and taking the time to be with her, awaiting her favorite, Carrots as a treat! There was no doubt that our beloved family member, Charlie, was in good hands with a person of professional hands on care, integrity and trustworthy, and most of all compassionate. 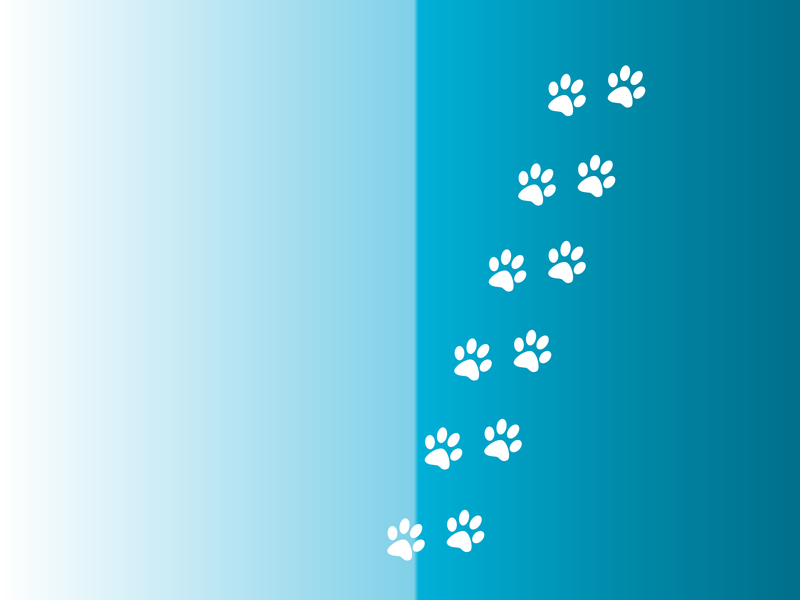 We would recommend Diane Mead of Pets First to all of our animal owners for an in-home care experience. "I like it when Diane visits. We go for walks and she brushes me." Max is a high-energy dog and really likes to chew. Diane took him as a boarder even when he was a puppy, knowing he wasn’t yet fully house-trained and that he would need extra attention to keep his chewing to appropriate toys. Diane has always been honest, straightforward and a reputable caregiver for Max. We would recommend Diane’s Pets First to anyone who needs a loving boarder while they’re away! 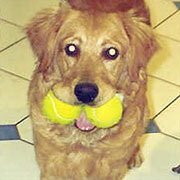 David Owen, Global Account Rep.
"I’m so happy when I visit Diane; she throws the ball and we play chase in the back yard. Plus, I get to see my other doggie friends." I trust Diane Mead and Pets First to care for my pet when my family travels. Diane is sensitive to the needs of each pet and she is dedicated to providing a loving environment for each pet under her care. 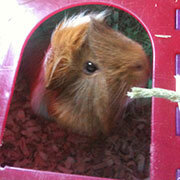 I have been bringing my son’s guinea pig, Brownie, to Pets First since moving to Portland in September of 2010. Diane has cared for Brownie many times during the past 2½ years, sometimes watching Brownie for stretches as long as two weeks. Diane knows how to partition the pets into areas so the dogs, cats, guinea pigs, birds and other critters all feel safe and comfortable. Always, when I pick up Brownie, his cage is clean, his water and food are both fresh, and he seems happy and relaxed. I have asked Diane to meet special dietary needs for Brownie and she has done so, even going so far as to pick up fresh organic vegetables from the grocer when the supply we provided ran out during our trip. I feel fortunate to have discovered Diane Mead and Pets First Diane’s Priority Pet Care. I travel without concern or worry for Brownie because I trust Diane to provide the same quality of care I provide at home. "She coaxes me out of my little house with treats and feeds me fresh green grass from her yard. She pets my head - I like that." 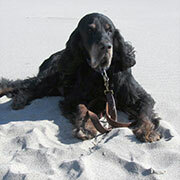 It has been such a relief to us to have such a gentle, and caring pet provider for our beloved late dog, Dytter. Diane was highly recommended by several of our neighbors, and we feel so fortunate to have "discovered" her. Dytter stayed with Diane on several occasions and was always so happy to arrive for her sleepover. She would wag her silly tail all the way up the driveway knowing that Diane was waiting to greet her. Diane took such good care of Dytter, and was accommodating of her special needs. Whether it was was helping Dytter into bed because of her arthritis or hand-feeding her when the pain from oral cancer made it difficult for her to eat, Diane always made our dog's care and comfort a priority.Although Dytter has now "crossed the rainbow bridge", we will look forward to having our future "pet children" stay with Diane. "In my final years Diane always gave me the most tender care…I know she loved me." We have been using Diane with Pets First to watch over our 3 cats while on vacation for about 6 years now. Every time we come home, Jade, Tiger, and Darwin are happy, content, well fed, and glad to see us! Every day, she leaves us personal notes and always lets us know about some fun thing that the cats did that day. She is always available when we need her, and we are EXTREMELY pleased with the services she provides. I let all of my neighbors know about Diane and Pets First, and I know that we are not the only ones who are very happy with her personal attention and care of our pets! "We would only appear together for Diane." No matter where I am in the world, I don’t worry about my cat Missy Marie because I know Diane is taking good care of her. She has been cat-sitting for us for about five years. When we call or email from our travels, Diane always responds promptly with details. When we return home, Missy Marie always appears healthy and happy, her food bowl is full, her litter box is clean and there are even notes describing Missy’s behavior during each of Diane’s visits. She is a pro and clearly an animal lover. I have referred Diane to some of my students and they are just as pleased as me. "Diane plays laser light with me!" Diane has walked my dog Lucky (a golden retriever) for almost five years. He really enjoys the walks with her. I asked her if she could brush Lucky and brush his teeth. She said, "Certainly." So now she also periodically brushes him and brushes his teeth. She does a great job and is very reliable, responsible and caring. Her service is invaluable. "We go for walks almost every day. I lost 20+ lbs in a year. My vet was very happy!" 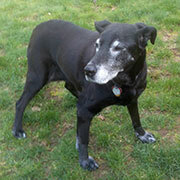 Diane has provided outstanding care many times over the past few years for our elderly lab mix, Lucy. Diane's loving, patient, enthusiastic manner has helped our shy, sensitive dog feel completely comfortable. During our vacations, we are completely confident that Lucy is receiving tons of "T.L.C." along with careful attention to her dietary and medication requirements. Diane's facilities are exemplary: lots of cozy areas, large indoor play areas, and an expansive yard, along with canine playmates. Our family knows Lucy is having a great time, and is in great hands, with Diane! "Diane always makes me feel welcome and comfortable. I like coming to see her." 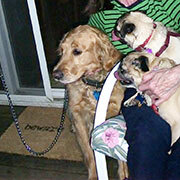 My family uses Diane Mead for her experienced care and comfort to our beloved pets. As she puts it we are only missing the partridge in a pear tree. She has been my business client for many years so I have gotten to know her and her family well. She is extremely caring, responsible, knowledgeable and allows us the support we need when leaving town, knowing that our home and pets will be well cared for. I trust she would take all measures necessary in the event of an illness and goes out of her way to meet the needs of our aging clan. I stand behind and promote her to all my clients as she is a trustworthy caring and professional person who will be an extended family support member for you and your pets. "I like Diane a lot!" 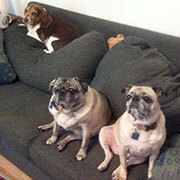 I have trusted Diane to provide a safe and comfortable home for my dogs for several years. They enjoy playing with her other guests and are eager to visit. They return home rested and relaxed. Her in-home care is superior to kennel boarding. "I love coming to Diane’s. I grin and grin and grin." Our two dogs, Sophie (7) and Kai (2), have never stayed anywhere but Diane’s when we are away. 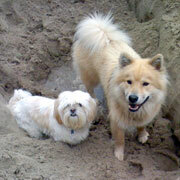 Our dogs are family and we need to know they are well cared for so that we can relax. Although they are both very different temperamentally, both dogs love going to Diane’s. When I arrive at her door, they are straining at their leads to get in and that helps me not feel too guilty when we take the occasional vacation without them. Diane has also come to our home at times when we know we are going to be too busy to walk the dogs during the day. I always feel good knowing that she knows their personalities so well, including all their weird little idiosyncrasies (like that Sophie won’t drink from a metal bowl!). 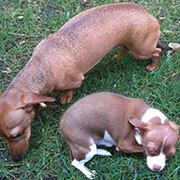 I would not hesitate to recommend Diane’s as a home away from home for your pet! "We love to see Diane whether its at her house or ours." 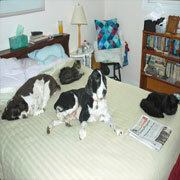 We would rate Pets First Diane’s Priority Pet Care a 5 Star rating. 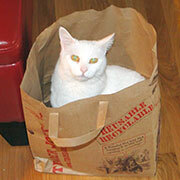 Diane Mead of “Pets First” is an excellent service provider and a lifesaver in our household. Diane comes into our house a couple days a week to take care of Lucky & Lucy and she delivers above & beyond the call of duty. She is dependable and follows through on what she commits to. Having Diane as a member of our pet care team gives us a big peace of mind. glycemic needs so I still have my buddy to play with. Now we both play with her!" 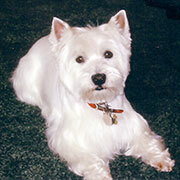 For the past fifteen years we have relied on Diane’s Pets First to care for our animals. Diane was the only pet sitter I could find when we moved here who was willing and able to give our severely diabetic cat his insulin shot twice a day. Super Chief was very placid and would arrive in the kitchen on time for his next shot. 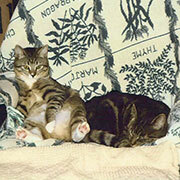 Zipper, our second diabetic cat, was the opposite-squalling and snapping with equal regularity every day. But Diane prevailed and I could stop worrying... And finally, Diane is responsible for uniting us with our Lhasa Apso, Tommy, the light of my husband’s life and the self-proclaimed “World’s Cutest Dog.” We couldn’t be more grateful for everything she does. "We love Diane. I even give her kisses and I don’t kiss just anyone." "Diane helped Daddy and me find each other!" Paula and I met Diane Mead about a year ago and began taking our 2 “girls” to her in lieu of the standard kennel approach. We found immediately why this was a world of difference for Molly and Tinker and for us as well. Diane has a genuine love for animals and when we take Molly & Tinker to Diane’s home, they literally run to her door and enter her house as if they live there. Diane is the best we have ever seen in her industry. We rest well in our travels knowing that our 4-legged family members are loved and well cared for.Diane takes the time to play, teach and communicate with our girls. Even when she has other “guests”, the environment and care provided create a safe, fun and loving home away from home for our furry family members. 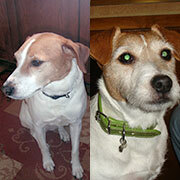 To Paula and I, Molly and Tinker are not just dogs, they are family and Diane is our choice to help watch over them. We highly recommend Diane to everyone and hope your pet meets her standards and receives her personal care. "When we go to Diane’s we run to the door because we own the place." We have used Diane and Pets First for many years. She is the best. Reliable, kind and very capable. 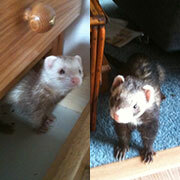 We have two ferrets. Anyone that has ferrets knows what a challenge they can be. They broke out of their cage once while we were gone (we have added latches since) and Diane was able to find them and coax them out from under our Waterbed. Our boy has been diagnosed with Insulinoma and Diane comes over twice a day to feed him his special food and give him his medicine. We also have three cats, who are shy and never come out, but she makes sure they are fed and boxes cleaned. She also gathers our mail and newspapers. We feel relieved that she is here for us and our fuzzy loved ones. "Diane lets us out of our condo so we can play in the family room and kitchen. She even cuddles us." We have been using Diane and Pets First for several years and have been extremely happy with the quality of care that Diane has given all of our animals. We have boarded our dogs in her home and they had their own bedroom and a large fenced backyard to use. Diane has also taken care of my cats and each visit takes the time to pet and talk to all of them. She even looks under the bed among the dust bunnies to find the shy one. She is the only pet sitter we have had that has seen and made friends with all of our cats. I would recommend Diane to anyone who wants the best care possible for their pets. She cares for each as if they were her own. "Diane makes us all feel safe." Dear Diane, Thank you for taking such good care of Eloise when she stayed at your home. She had such a good time and felt like one of the family. Eloise loved the big closed-in backyard so she could run and play anytime. On the care note, Eloise came with a broken toe and it had to be kept clean and her paw had to be in a little plastic pouch. Diane changed it and made sure her foot didn't get wet. Eloise would go there at any time for such special care. Thanks Diane, we don't usually leave Eloise, but felt very comfortable leaving her with you when we did. We knew she would be in capable hands from the time we did the interview to the time we picked her up. I would recommend your pet care. "Diane kept my paw clean and dry when it got hurt." We always leave our pets with Diane when we leave town. She is always highly professional and responsible, so we never have any worries about the welfare of our dog and cats when we’re gone. I would highly recommend Diane to anyone who wants to vacation with complete peace of mind about their pets happiness and safety! "When my parents go to their resort I go to mine at Diane’s." 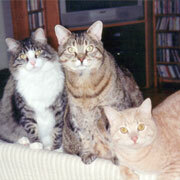 Diane Mead has taken care of my beloved cats, Dibs and Dinah, many times over a period of five years. As elderly kitties, they need special feeding and Dibs is extremely shy and often disappears in the company of strangers. 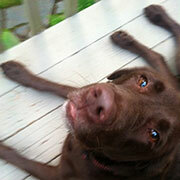 Diane's extensive knowledge and love of furry clients is evident in the excellent care she provides. Owner absence can be tough on pets but it is obvious from Dibs' and Dinah's behavior when I return that they are rested, happy and healthy. I will entrust Dibs and Dinah to Diane only. Her integrity, knowledge, reliability and care meet the highest standard and enable me to go away with complete peace of mind. "Diane feeds us, talks to us and pets us. We don’t even worry that Mom is gone." 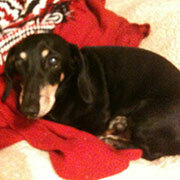 For over 10 years, Peter our 14 year old Miniature Dachshund has stayed with Diane while we were away. He always gets the very best of care from her. Sometimes we have the feeling that Peter wishes we would go away more often so he could play with his friends at Diane's. "When the suitcases come out I go directly to the garage door—even if it is a day early, 'cause I know I'm going to Diane’s." 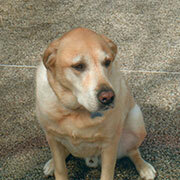 Our yellow lab, "Turbo" absolutely loves going to Diane's home for a vacation retreat! He jumps out of the car and happily runs up to her door. We have gone on numerous vacations up to 21 days at a time, and come home to a happy, Healthy dog! It is such a good feeling knowing your dog is in good hands while you are away. "Are we going to Diane’s? We’re going to Diane’s aren’t we? We’re really going to Diane’s!" We are the proud owners of 2 Labrador Retrievers. 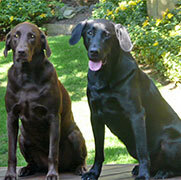 Toby (black male) is 9 years old, and Teaky (chocolate female) is 8 years old. 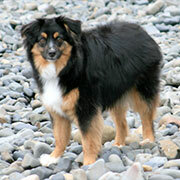 They bring joy and companionship to us with their devotion and happy personalities. When we are out of town for business or pleasure we absolutely need to count on someone to care for our pets with care and respect to the dogs' needs and our requests for special attention for them. 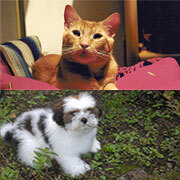 Pet's First Diane's Priority Pet Care has been our choice for several years to meet those requirements. Diane is attentive and caring and works above and beyond what is needed. Our dogs are relaxed and happy to see us upon our return, which tells us they are being well cared for. "Diane comes to see us. She feeds us, plays with us and takes us for long walks. We like Diane."